Democracy is an American value, not one that can be attributed to one political party or ideology. The maintenance of a free and fair democratic process is an issue that every American should be able to get behind, regardless of what party they claim to support (if any party at all). Unfortunately, decisions by the Supreme Court to remove virtually every limit on money in politics have opened our elections process to a hijacking of our democracy by moneyed interests. American elections have become billion dollar affairs, with numerous interests jockeying for power through political donations. By giving money to politicians, various groups and individuals try to get “their” candidates into office and keep them there—once these candidates become sitting politicians, the donors can come to their offices and “request” favors and services. The money that is given to politicians acts as a lever and allows donors to influence policy by promising funding, withholding funding, or even threatening to fund opponents. Wolf-PAC is a non-partisan organization that exists for one purpose: To pass a constitutional amendment that forever removes money from politics. By passing this amendment through the states, Wolf-PAC hopes to bypass the corruption of Washington and let the people control the process by which money is taken out of politics—this method of removing money from politics is more effective than going through Washington, simply because it cuts through the potential obstruction by politicians who are currently bought. Interest Group Influence over Politicians: When money equals speech, large aggregations of power (ex. 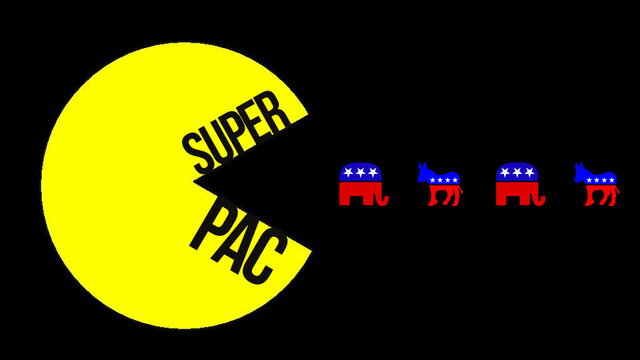 corporations and unions) are able to spend huge amounts of money in elections. This money allows these groups to directly affect policy and buy politicians to support their interests. Unions, which often fight conservative policies, spend considerable amounts of money in politics and are able to affect labor policy by buying politicians. Corporate Welfare: If money is allowed to govern politics, there is little chance that corporate welfare will be reduced—corporations can simply keep buying politicians and telling them to keep the subsidies on the books. Giving profitable corporations (or corporations which, without subsidies, are insolvent) subsidies is bad policy and only serves to increase the national debt. Multi-National Influences: Dark money and the use of Super-PACs has allowed foreign entities (ex. Pakistan) to involve themselves in American politics. This is simply wrong, and must be stopped in order to prevent the United States from losing control of its policy to the highest bidder. American public policy should be dictated by the will of the American people and the constitution, not by an international auction for political influence. Interest Group Influence over Politicians: When money equals speech, large aggregations of power (ex. unions and corporations) are able to spend huge amounts of money in elections. This allows those with resources to directly affect policy by buying politicians to support their interests. As progressive policy often doesn’t benefit corporate interests, the ability of corporations to spend money in elections is a direct impediment to passing progressive policy. Rigging Taxes for the Rich: A Progressive tax code is difficult to sustain when the rich are allowed to buy politicians. Rich Americans who don’t want to pay a fair tax burden can simply “contribute” enough money to get their politicians into office and then get these individuals to cut their tax rates. Small money can try to compete with big donor money, but this is unlikely to succeed (the largest 2012 donor was Sheldon Adelson, who donated $150 million). Setting up the Wrong Economic Priorities: If money is allowed to equal political power, legislators will shift their priorities to account for this. Because they need to cater to the rich for election, they will pass legislation that is beneficial to the wealthy, regardless of the effects on the rest of the country. Progressive programs which benefit the needy, as well as the social safety net, will be targeted for cuts (or elimination), simply because they don’t benefit the wealthy and are places where money can be taken from to fund tax breaks for the rich. Privatization: Because we have privatized some of our public services (ex. private prisons), money in politics is very dangerous. Providers of these services are able to buy politicians, get them to deregulate them and sustain their public contracts, regardless of the quality of their services. While it is grossly unfair to condense the entirety of the American electorate into conservatives and progressives, these two arguments serve to demonstrate that different ideologies are able to reach identical conclusions on the issue of campaign finance reform. Every ideology may reach the conclusion that money corrupts government in a different way, but they all get there eventually. In short: Americans, of all political philosophies, want Washington to work, engage in honest debate, and be responsive to the American people. Other issues may divide us, but we all agree that our policy differences should be settled without moneyed interests buying our electoral process and corrupting our government. Work towards getting money out of American politics so that we can back to an honest debate over our country’s policies. Until we solve the problem of legalized corruption, no other honest debate is possible—every conversation is corrupted by “campaign contributions” which are little better than legalized bribery.